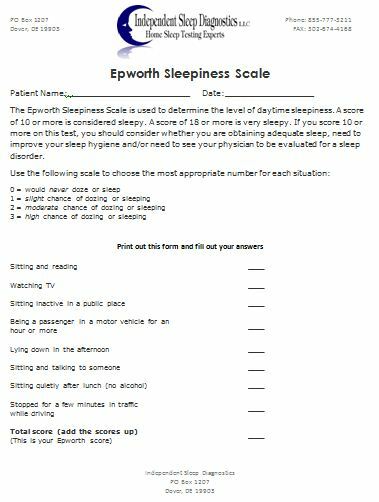 FAQ - What is the Epworth Sleepiness Scale and can I get a copy? The Epworth Sleepiness Scale is a tool used by many sleep specialists, medical doctors, physicians and other medical professionals to help determine the level of daytime sleepiness a patient is encountering. The patient's answers to the short list of questions are ranked from 1 to 3. On the scale a score of 10 or more is considered "sleepy". A score of 18 or more is "very sleepy". If you score 10 or more on this test, you should consider whether you are obtaining adequate sleep, need to improve your sleep hygiene and/or need to see a sleep specialist. These issues should be discussed with your personal physician. We have included a link for you to download a copy of the Epworth Sleepiness Scale on this page.